Chloe is 1yr 8mths. Chihuahua who has just come in to rescue. She has been abused by many children so we are seeking a peaceful quiet home for this darling little girl. She will not be available for a few weeks. 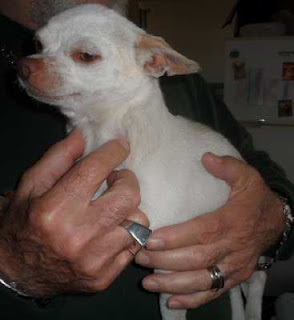 She is a white smooth coat with some tan markings. When she is ready for her new home she will be desexed, immunized, microchipped, wormed, and given flea treatment. Her cost will be $500. Photo to come.later. Chloe has been happily re-homed and is now known as Penny. Read Penny's Chihuahua Rescue Victoria Success Story!